I’ve been waiting for blackberry season for a few months now, initially observing the profusion of blossom with anticipation but realising as the wet weeks passed that the promise shown in May would never be delivered. With what we we could gather last weekend it wasn’t worth contemplating jam, so for the next 12 months we’ll have to continue relying on Folláin Teo…how bad! Their jams are great, I particularly like the raspberry and blackberry, which are tart enough to retain the full fruit flavour and aroma. Anyway resigned yet consoled, I recycled my stash of jars (I even had enough lids!) and travelled to Ballyvourney to talk to Peadar O’ Lionáird about jam making, fruit growing and the bad weather. As I left with a few new products in hand to take home and taste Peadar reminded me again to put the word out that they are actively looking for blackberries from local pickers. So if the sun has warmed the hedgerows near you and you’re interested in picking a few more kilos, give Peadar a call on 026-45288. Just found this really good blog post on Totally Cooked about blackberry picking. It has good advice, especially on jam making and avoiding dog pee. The motion was co-signed by Cllrs. Robert Walsh, Paul Hayes, Anthony McDermott and myself, and the remaining five councillors will be contacted today (Tuesday) inviting them to avail of the option (if they wish) to go into the Town Hall to also sign it before 5.00pm which is the deadline for submission of motions. Also, as per the public meeting last week, a deputation of three people who support the market idea, has been arranged. They will be received at the start of the council meeting (7.00pm sharp). As per Standing Orders, two of the three will be given a maximum of 5 minutes each to address the council on why it should allow the market to be held and in the location that’s being suggested. After they have spoken, they will be thanked by the Mayor, and the council may discuss what has been said, but will not be allowed interact with the speakers, or the speakers will not be allowed to make any further comments. The motion will then be discussed later as part of the agenda which is where things will be won or lost. Important that those who are interested make every effort to attend the council meeting. You must be in the chamber and seated by 7.00pm and cannot interrupt the proceedings. Numbers might be curtailed if Health and Safety or Fire regulations are in danger of being breached, so first in first served, so to speak. Those who favour the market should at this stage be working to influence the other councillors not mentioned above to either vote for the motion, or abstain. To be successful we only need a majority of one vote. There are nine councillors. Four have signed the motion and therefore will be voting Yes. The remaining five could vote NO to defeat the proposal or if some abstained, to still allow a majority of one carry it. The Mayor would only use his casting vote if there’s a tie (as happened in March). Feel free to forward this to interested parties and individuals. Hi all, Please try to come for a short peaceful demonstration outside the Teagasc Offices on Model Farm Rd on Tuesday 26th at 3pm. We want to show our displeasure that Teagasc is one of the main sponsors of the pro-Gm Conference in UCC. Apparently they donated 50,000 euro. The Agricultural Biotechnology International Conference (ABIC 2008) at University College Cork this Monday, Tuesday and Wednesday will promote the release of patented GM algae, crops, trees, fish, and livestock as a solution to rising food and fuel prices and climate change.The conference is being organised by a Canadian foundation with funding from the Canadian Government, industry lobby groups, and corporate agri-biotech giants including Monsanto, Dow AgroSciences, and BP Bio Fuels. About 400 delegates taking part. We are protesting the fact that the conference is being co-sponsored by seven Irish government or semi-state agencies including Teagasc (the prime sponsor which is also chairing the event), Science Foundation Ireland, Enterprise Ireland, the Marine Institute (Foras na Mara), the Food Safety Authority of Ireland, and Sustainable Energy Ireland. This abuse of public funding to promote GM food and farming violates the Government’s agreement to negotiate to declare the whole island of Ireland off-limits to GM crops. We hope our protest will result in a renewed Government commitment to do this and take action to enable farmers to source non-GMO animal feed which is available to their competitors in other parts of the EU. A Chance to Show Off! 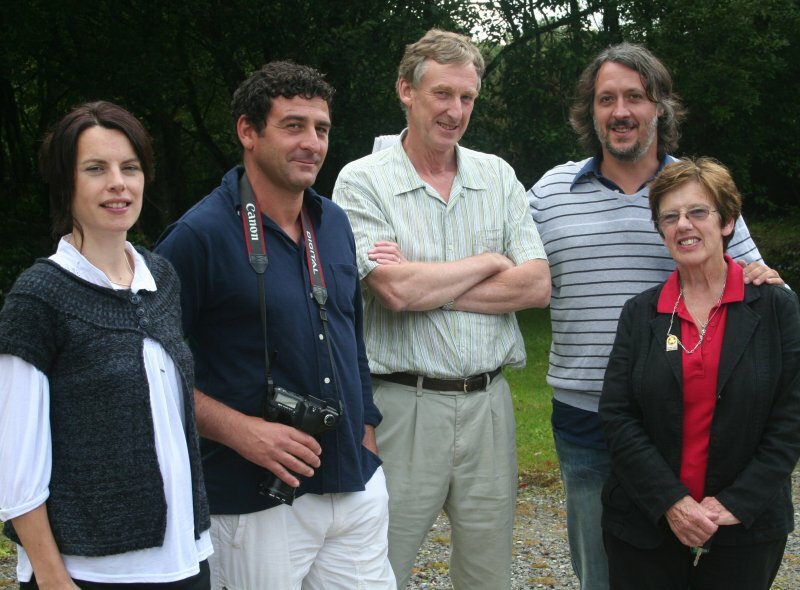 On Thursday last my colleague Jean and I enjoyed an opportunity to show off a bit of West Cork to two visiting Italian journalists on a familiarisation trip organised by Failte Ireland – Gabriele Zanatta from Milan and Massimiliano Rella from Rome. They were accompanied by Kinsale based Italian speaking guide Marguerite Condon. We kicked off at the Kinsale Wine Museum where we had an excellent guided introduction to Desmond Castle, the Fitzgerald family and the winegeese. From there we stopped in to chat with Paul McBride and Iain Flynn about their growing food business. I was delighted to hear that they are looking at moving to a larger premises to handle the growth in demand and get their excellent meals out to more shops. This was followed by a delicious lunch al fresco at Fishy Fishy Cafe. 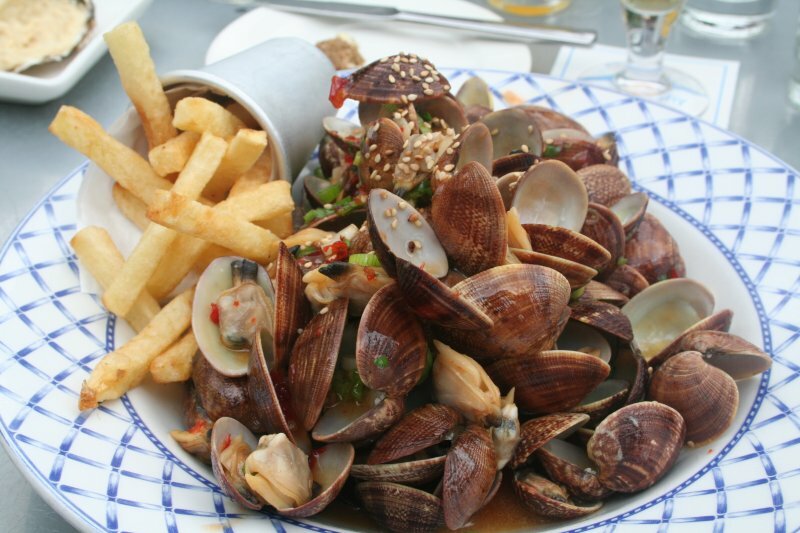 I had the clams with ginger and sweet chili sauce (see pic). The two guys were very interested in the area and the local food, particularly seafood. 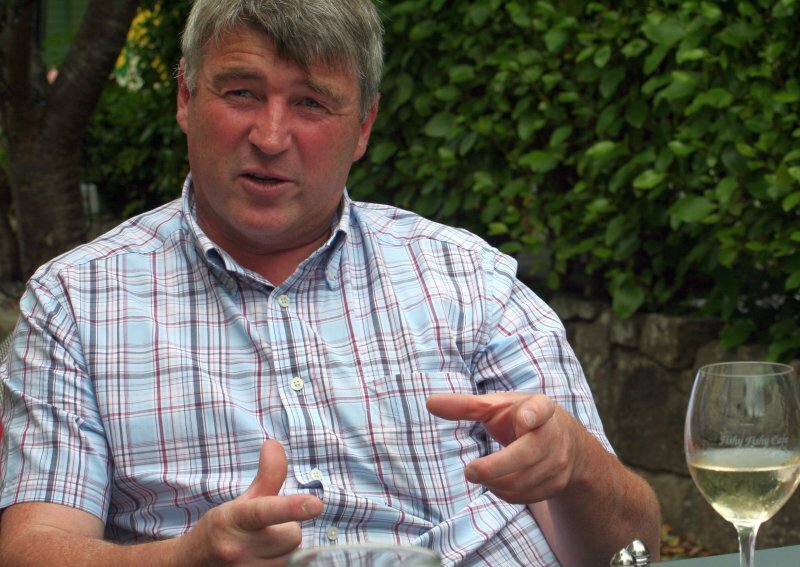 Chef and proprietor, Martin Shanahan joined us when we had finished eating and shared his thoughts on fish. Now that he is running two businesses he finds that he cannot spend as much time in the kitchen as previously. “Part of my role now has to be teaching. The most important part of the business is buying the fish and I will never give that up. I go to Skibbereen for the fish auction nearly every morning and also buy directly from about 10 local boats. In the last 10 years fish has become a global commodity, it wasn’t like that before but now generic white fish can be flown in for a fixed price at any time of the year from Chile, Thailand or elsewhere. We left Martin and took the coast road to Kinsale, pulling up at Garretstown to get a sense of beach life on an overcast summer’s day. 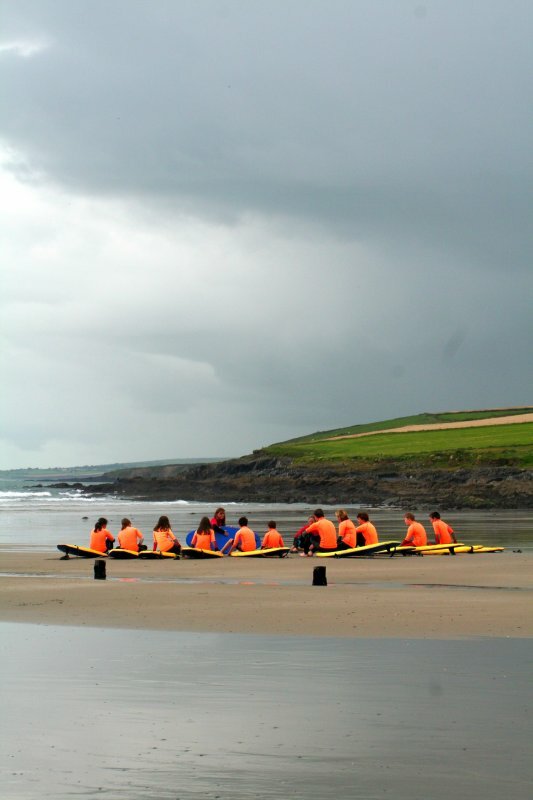 This surf lesson created a lovely splash of yellow against the gathering rain clouds. Anthony Creswell met us at Ummera Smoked Products in Timoleague and gave our visitors a run through the process of smoking salmon. Anthony is fairly confident that we don’t need to go to Norway or Scotland to trace the roots of fish smoking in Ireland. “Smoking to preserve fish caught in times of plenty would have been practised all around the coast. All you needed was salt, which we did import in large quantities. Of course the smoked fish they produced then was quite different from this. It would have been extremely salty and much drier to last through the winter months. They’d eat it when there was nothing better to be had.” Happily, the same could not be said of the Ummera smoked salmon and gravad lax that Anthony treated us to! I meant to post this right after the event. It’s not really news now, but for anyone who missed the public meeting regarding the Clonakilty market last week (and that won’t be many I know), it was tremendously positive. Over 90 people attended, most had to stand at the back of the room, some were left in the corridor, listening attentively. Mick Hanly, chaired and very well too – if there had been any dissenting voices in the room it was clear that he would have been up to the task of affording them space to be heard. But as he said himself “The first thing you find out if you’re going to a duck shoot in West Cork is ‘who’s the duck?'”. There was no-one present willing to put a case against the market. The absence of the 4 who voted against the proposal was a real source of dissappointment, even anger, for most of those in the room. The feeling was that the people of the town had elected these people to represent the interests of the town not themselves. It’s fair to say that there was a high degree of frustration among many at the meeting at the ability of a few individuals to block what appears to be the will of everyone else. Even the Mayor, Michael O’Regan, who had missed the vote, was prepared to say that no-one in Clonakilty was opposed to the market in principle. One or two of the traders expressed their cynicism about local authorities and argued that the only way forward was to force the issue through continued trading on the basis of ancient market rights. I do not think this is the way to go. For one thing, a victory for this initiative would defeat the Casual Trading Act and result in an unregulated market – anyone could come in and sell anything, without paying any license fee. It would not be the food market that Clonakilty wants. And besides, local democracy can only work if people are willing to make it work rather than try and exploit weaknesses in legislation to subvert it. I’m glad to say that this was the outcome of the meeting. It was agreed to send a delegation to present the market proposal again and that the coucillors present would all support a new motion. The town council meeting to discuss the motion will be held next Tuesday September 2 in the Town Hall at 7pm and as Cllr Anthony McDermot said “There’s nothing like people power”. There is an open invitation for people to attend and observe the meeting (some 30 can be seated, but more could show their support outside the meeting). Attendees cannot speak but the 3 person delegation will have the opportunity to represent the views of the townspeople as expressed at the public meeting. See my post above for details of the motion. An event to highlight the importance of Local Food Production-Sunday 28th September, 11.30am-7pm. Due to the rising costs of fossil fuels and the effects of climate change, the security of global food production is in jeopardy. As awareness grows, the importance of producing food locally is becoming apparent and tangible solutions need to be developed. This year An Sanctoir – a 30 acre holistic community owned and run project just outside the village of Ballydehob, West Cork, has begun to look at community food-growing activities and is taking part in this year’s Growing Awareness farm walk programme. The guided walk will take in the Nature Trail which supports a wide variety of wildlife and habitat areas, and will finish in the new Forest Garden Project begun this spring. The full days’ programme will include a selection of speakers, demonstrations and activities on topics such as: Beekeeping; Working Horses: Community and Schools Gardens; Allotments and Vegetable Box Schemes; Fruit and Nut Growing; Basket Making; Seed Saving and much more. Come along and enter the Heaviest Pumpkin and the Largest Diameter Sunflower Head competitions, and enjoy the on site Cafe from the deck of a 40ft Pirate Ship whilst being serenaded by local musicians! People are also welcome to bring a picnic. The Café will be raising funds towards the running costs of the event and there will be no admittance charge. We therefore encourage people to donate generously, and all profits will be put forward to help pay for the wheelchair accessible pathways recently put in place in the An Sanctoir Forest Garden. This event is supported by Sustain West Cork and West Cork Community Partnership. Further volunteer support and sponsors welcome. Healthy Food for All and Safefood are establishing a Demonstration Programme on Community Food Initiatives and are looking for funding applications from eligible groups and organisations. The purpose of this funding is to establish a Demonstration Programme of Community Food Initiatives (CFIs) on the island of Ireland. Between five and seven CFIs will be funded over a three year period. Each CFI will receive annual funding over a period of three years to set up, manage and sustain a project. Funding will be up to a maximum of €75,000 (£60,000) provided on an incremental basis over the three year period. CFIs are projects that improve the availability and accessibility of healthy food for low-income groups at a local level, using a community development approach. This funding is open to community groups or groups which have an anti-poverty focus in their work. We would especially welcome applications from partnerships/collaborations of different groups. As the programme has an all-island focus, a minimum of two projects will be selected from both the Republic of Ireland and Northern Ireland. For more information and to download application form, click on Community Food Initiatives <http://www.healthyfoodforall.com/content/view/58/42/>. 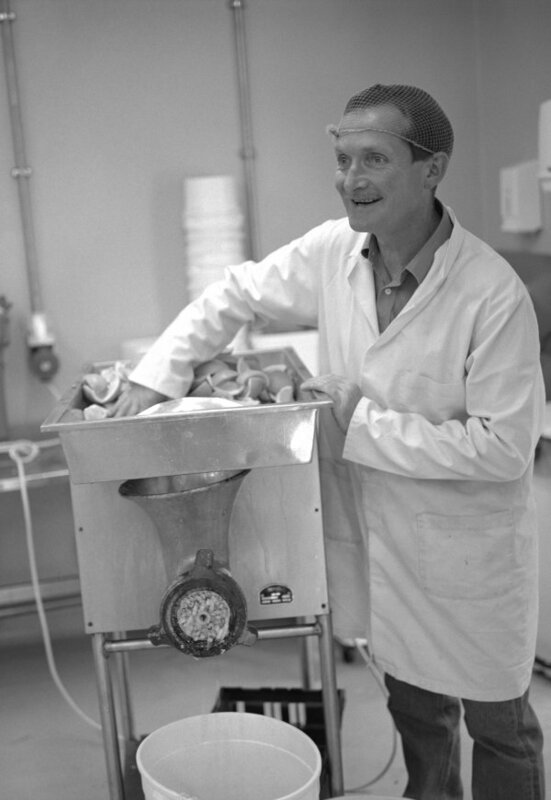 More information about CFIs and case studies is available atwww.healthyfoodforall.com <http://www.healthyfoodforall.com>. The closing date for applications is 30th September 2008. Phone or email any queries :info@healthyfoodforall.com. Grant on What does free range mean?